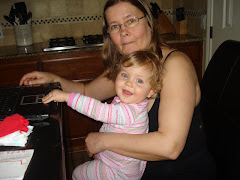 I had not gotten to see my granddaughter Kasja since she was three weeks old. The internet and following Kristy's blog has been my lifeline to keep up with Kasja's adventures, much less seeing her in all our bargain finds. But there is no substitution for seeing her in real life. I got the privelage of driving up to the Twin Cities and meeting up with Kristy, Chris and baby Kasja as they had a work trip up from Texas to 3M. Kasja and I hug out with Aunties Becca and Detamara while Mom and Dad were at work and Grandpa caught up on his reading. The family got together for several outings... a trip to Rochester to meet Great-Grandpa and Great-Granny Yurcek, brunch with the Eke extended family, a Gluten-free Pizza Outing, Gluten-Free Pancake Lunch with Uncle Nate, The Hollidazzle Parade and Downtown Minneapolis Macy's Holiday Auditorium Adventure. Living for a week in the Hilton with no housework and playing with Kasja was a dream Holiday, and of course big city bargain shopping. Today I received a flyer announcing up to 70% off at Carter's stores and another coupon for 10% off your entire purchase this weekend only Friday through Sunday! Two weeks ago I bought my Granddaughter Kasja these pajamaes that says it all. Grandma's are for spoiling. The last time I went to Carters I ended up spending only 32.00. I bought these Santa Grandma Two Piece Pajamas, a Holiday Christmas Dress, Angel Top, Velveteen Embroidered Heart Cordoroy Pants and a Long Sleeve T-shirt Onsie. A $113.00 value. This store is dangerous for Bargain Seeking Grandmothers. I returned from my Minneapolis Grandma Holiday Trip to find that my debit card was no longer working. Jim was still out of town due to return on Sunday and he had no access to using our bankcard. It was Friday night the bank is closed and couldn't check our balance when a friend told me to call the banker at home. Thank heavens we live in a small town. He told me that while we are all out shopping so has the Grinch from my bank account. The banker informed me that the bank had caught as many as 50 different clients accounts that had fraudulant transactions being debited out. The bankcard numbers had become comprimised. Our bank as a limit on our debit transactions and the two transactions against our account were over the limit. The bank Hotcarded our bankcard to protect us, suspending our account. But that left us in a quandry, we couldn't access our cash, and didn't notify us. We carry a credit card with a small balance for just this sort of emergency. Jim will be able to take Nate and Stacey out to eat and still get home. We will keep a limited amount of money in the account with the debit/credit card. We will be opening a separate account has the bankcard connected to it. I will be putting the largest of the money in the savings account, the main checking account will not have a bankcard, (it will be deactivated) and our living expense account will have a bankcard with limited funds availability. The Grinch cannot get much. We will be making sure that our accounts are not automatically connected. The bank told me that most bank accounts will automatically be connected to protect you from overdraft charges. But for the Grinch, it gives it free reign to go into the next account and you will be surprised to find the account drained. I will be watching daily on my on-line banking for fraudulant transactions. We use our card as Credit instead of Debit (it is insured) and we are very thankful for our low debit daily limit. It saved us being Grinched to the tune of $1100.00 on Friday. We will keep an open small credit card for emergencies or in case we get hotcarded again. It saved us being stranded out of town penniless. In this tough economy, we are all struggling, and so is the Grinch! On my way home from Minneapolis, I couldn't pass by Walgreens in Viroquoa WI. I had no way to print the needed on line coupons and had to rely on my stash. I am inspired by all the postings at Deal Seeking Mom http://dealseekingmom.com and http://iheartwags.com where I found many of the items here. Idea: What do you do with all the extras? Many bargain hunters are donating them to the local shelters and food pantrys, I will give you another idea. Donate them to the disabled living in group homes as they are forced to live on very little. Being an advocate and parent of disabled kids and adults I get a unique view of how hard it is to be disabled and poor. Most of their SSI checks go to pay for their group home payments and they may have as little as $40.00 for their personal care items and spending money. 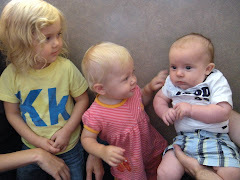 Today we were in Minnesota to take care of our new granddaughter Kasja. to buy her niece her very first Animal at the Mall of America. Regular Price of $78.00 for $39.00. Which makes it all half price!!! a Build A Bear Calender to each box (3) and in it was another coupon for $5.00 off of $25.00 which is good in 2009. Becca has already put them into her wallet for our next trip. my gift card from my Christmas purchase. Becca proudly saved $40.00 and paid a proud $26.36! Auntie Becca initiated her little niece into her favorite animal place to go after all her surgeries and doctors appointments and the cashiers were impressed with her bargain hunting skills. 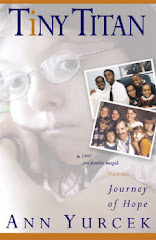 Win An Autographed Copy of "Tiny Titan Journey of Hope". Winner of the Mom's Choice Award for Best Adult Non Fiction. The Mom's Choice Awards honors Family Friendly and Inspiring Media. Along with a chance of the book, you can read the Christmas Chapter on the website. The Christmas Story was told in the November 24, 2008 issue of First Magazine. Last Christmas Nippon Television a major network in Japan recreated the Christmas Story. In 2006, Madison CBS had a Holiday feature that can be seen by visiting our website or clicking here. Christmas Miracles are meant to be shared and we all wish you a very Merry Christmas from our family to yours. 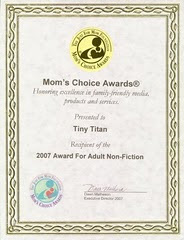 Visit Our Stories Website http://www.tinytitan.org and leave a comment naming correctly our Tiny Titan and we will randomly select the winner on December 21, 2008. This is my first attempt at blogging thanks to all the assistance by my daughter-in-law Stacey and Nate getting our computers back up and running after purchasing a new one on Black Friday. Finally I got to play with double coupons at our small town KMart. This is what I got for FREE!! I have missed my doubling adventures since we left Michigan two years ago. Every week I get five newspapers, two Milwaukee Journals, One Wisconsin State Journal, The Dubuque Telegraph Herald, and the Chicago Tribune so when I find deals I can get five of each. The boys were home for Thanksgiving and emptied my shelves for their apartments and I needed to restock. The cats will be getting spoiled with their treats instead of boring dry food. Not too bad for two hours of my time. I was intimidated at the prospect of learning all this... but it isn't too bad. I figured that if I could write and publish a book, I should be able to figure out how to blog.